I don’t know about you but my son just adores his seat belt. (Cough….Who doesn’t, right? Hmmm…) He puts it on all the time without fail, never fighting even a little bit, all by himself with no coaxing. (Can you tell I’m kidding?) Well, now he does. You see, very recently we were able to install his favorite accessory of the car. The fun, new SeatPet. 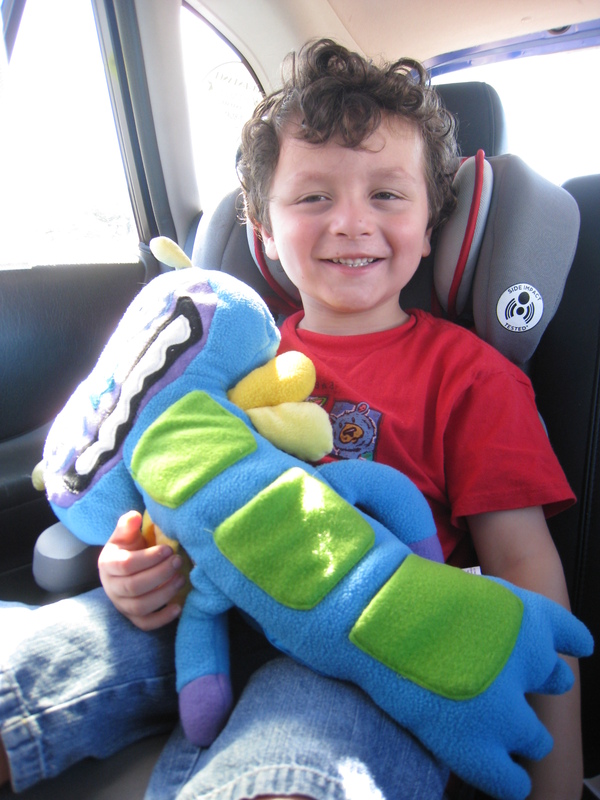 This wonderful invention takes the idea of a a seat belt cover and adds a few upgrades- It is a seat belt cover, a stuffed animal, and a handy storage container for the car (and a very useful nap pillow). Watching him nap in the car without anything just makes my neck hurt, and leads to the “car shuffle” to find his small pillow. But with the SeatPet he always has a pillow to pass out onto/with. The critter is so soft and cuddly, you can even get away with bringing him inside at your destination as your little ones plush of choice for bed. There are so many possibilities, it is great. The part I am most impressed with are the pockets. Instead of just having a big stuffed animal seatbelt cover, a great idea unto itself, there are pockets. Lots of them, some zippered some open so you can hold all kinds of surprises inside, from little toys to a pack of gummies and a box of raisins for a snack. SeatPets are easier to use without carseats, since the buckles make it difficult and it gets wound up in the seat belt “catch” of the carseat- not impossible, just a little time consuming. I think best for kids who are in boosters or out of carseats. 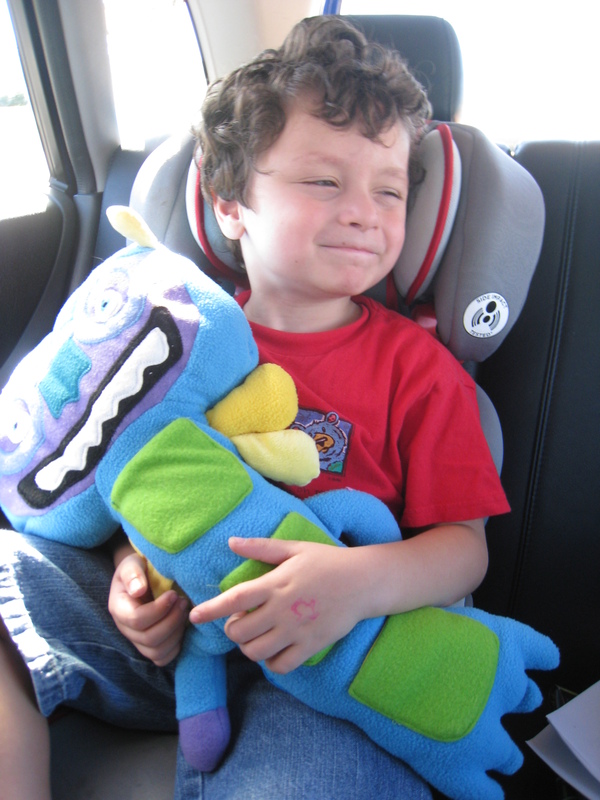 Little Man loved his Airheart because he is blue and green and looks like a soft bug. There are a total of three varieties of SeatPet available: Airheart, Awty (Are We There Yet), and Whish. All of which are perfect for a long car ride, especially now that the cooler months are upon us and a little something extra warm and snugly is appreciated when daddy likes to keep the window open.